Four-Piece Founding Fathers Pocket Knife Set - Four Folders - Stainless Steel Blades, Decorative Native American Indian Chief Handle Art, Wooden Display Box - Length 4 1/4” | BUDK.com - Knives & Swords At The Lowest Prices! 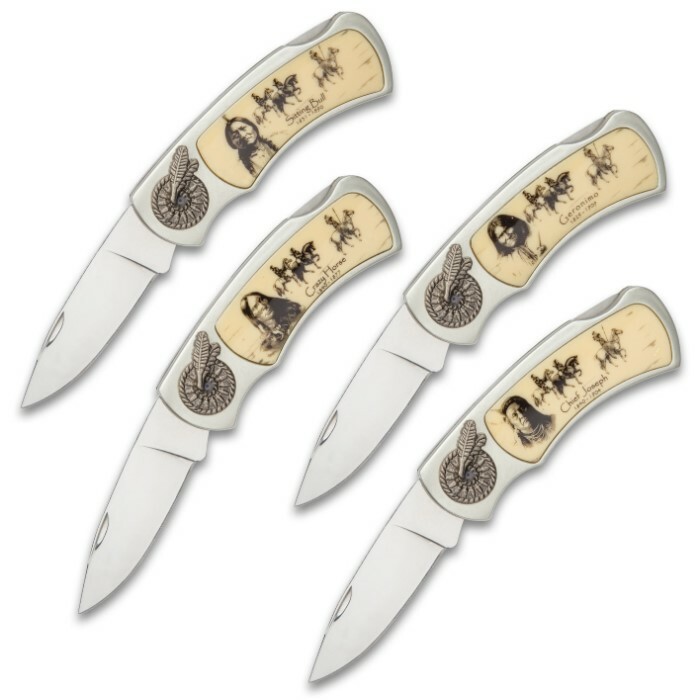 Display all four Native American heroes on your mantle with our handsome Four-Piece Founding Fathers Pocket Knife Set. 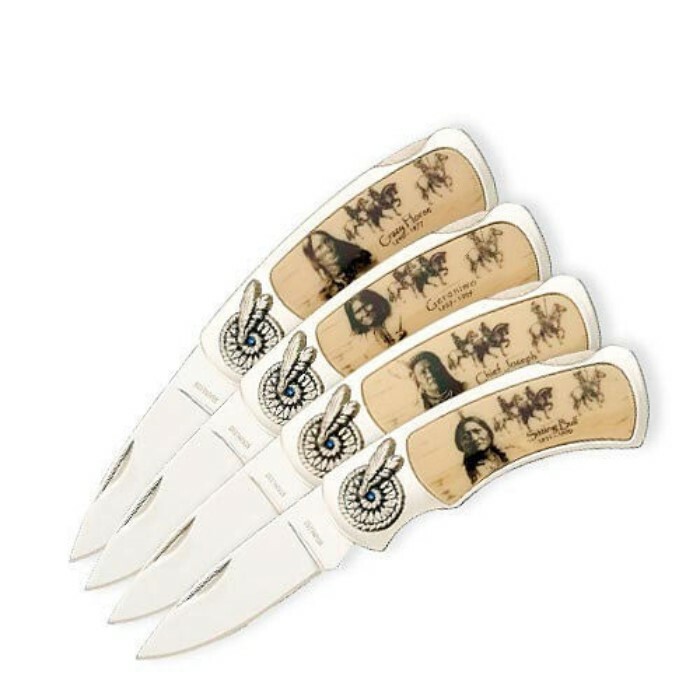 This four-knife set comes complete with a wooden display case that features beautifully drawn “Founding Fathers” artwork inside the lid. 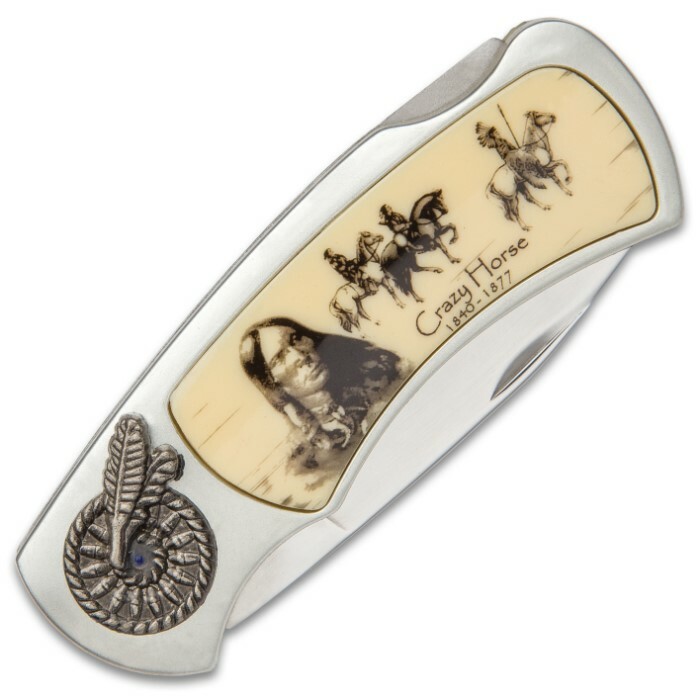 Each pocket knife has a brushed nickel handle, inset with incredibly detailed artwork portraying one of the historical Native American “Founding Fathers” including Crazy Horse, Chief Joseph, Sitting Bull and Geronimo. They also have a 3” mirror polished stainless steel blade that has a nail nick for easy opening. 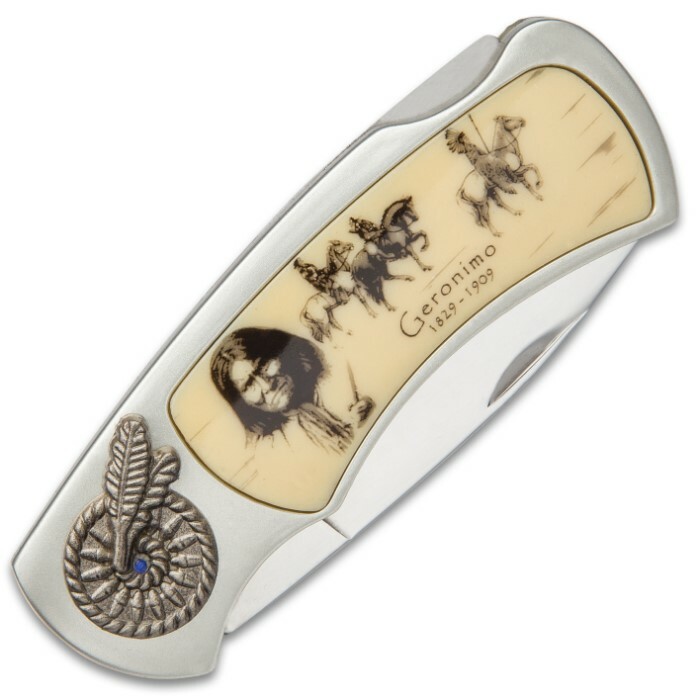 The attractive cherry colored wooden display box has black felt lining and a compartment for each pocket knife. It was better than I expected. 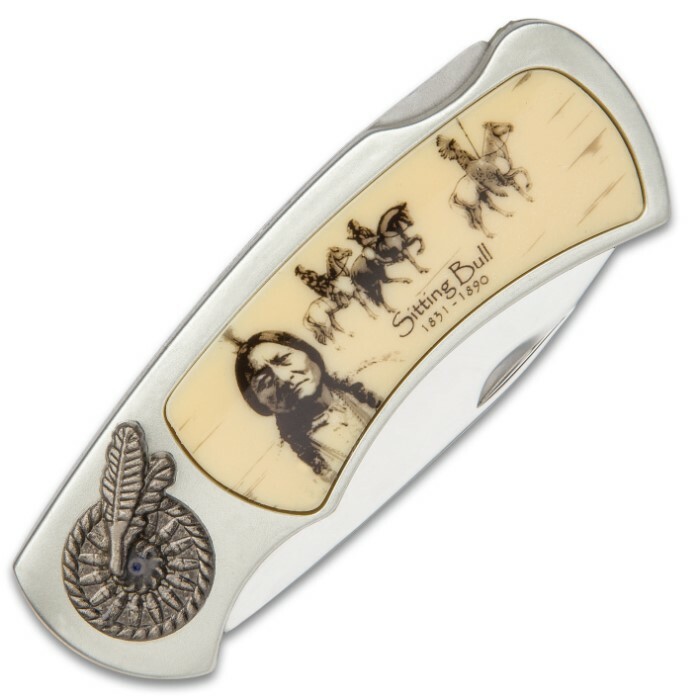 The display box is well made and beautiful. The knives are also well made, exceeding my expectations. 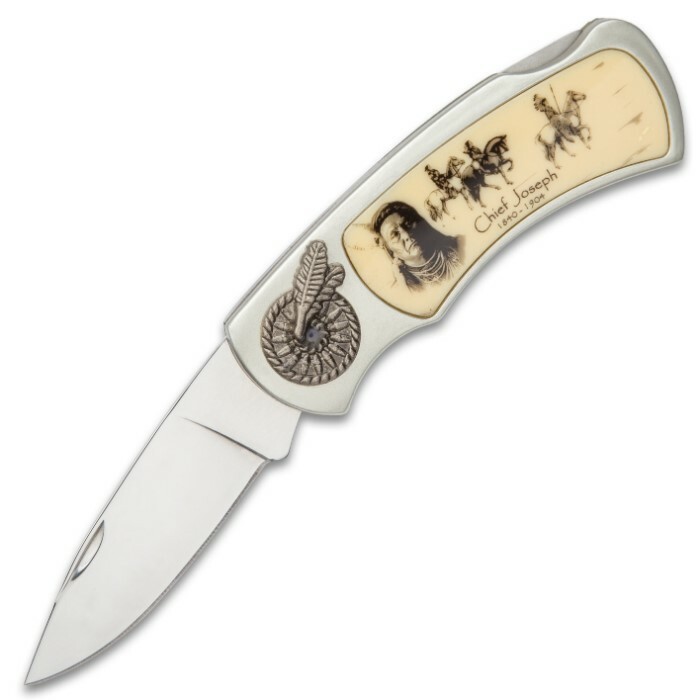 The knives are "lockbacks", my favorite locking type. One suggestion for the shipping dept. The set should be BOXED for delivery. It came in a soft padded mailing bag resulting in a very small nick in a corner of the display box. Nothing serious, but could have been a lot worse because of the weight.